It's a little past 3:00am Eastern Standard Time (when I started this blog entry). Being the tennis fan that I am, I stayed up late with the hopes of watching the Tennis Masters Cup final between Roger Federer and David Ferrer. In theory, it was a great plan, until to my utter dismay, I realized there was no live television feed of this match on any Canadian channel. TSN and RDS had the rights to cover the Tennis Masters Cup final, but both channels were showing it on tape delay. Investigating further, the only US station that had this match live was ESPN Deportes, the Spanish version of ESPN. There was no live tennis on ESPN, ESPN2 (or any of its HD feeds) or even the Tennis Channel. With absolutely no offence to any Spanish viewers, surely there must have been other English and even French speaking tennis fans in North America who would have wanted to watch this match live! Tennis Channel (which didn't have the rights to the singles matches anyways) was showing infomercials. Granted, with the Tennis Masters Cup being held in Shanghai, it is not the most ideal location in terms of time difference to match up with the North American TV viewing schedule. That said, surely the ATP's prestigious year-end event, which is suppose to showcase the best in men's singles tennis (I promise I'm not forgetting about doubles either), deserves to be shown live on at least one English speaking channel. Instead, all these North American channels (with the exception of ESPND) showed repeats and highlight shows. Yes, repeats and highlight shows! To me, this is a clear demonstration of what is wrong with television coverage of tennis. When repeats and highlight shows are deemed to be more important than the Tennis Masters Cup finals, what hope does tennis being a 'must-see' live sporting event? Don't get me started on the US Open Men's final, which doesn't start at a specific time (e.g. 4:15 pm), but rather, starts when the television coverage of the NFL game ends (such that CBS can then switch over to tennis). If that NFL game goes to overtime, guess what event has to wait? It is really a shame that there is great coverage of tennis tournaments in the US Open Series over the summer, which is then followed up by tape delayed coverage of what is suppose to be the big year-end event. Perhaps when the Tennis Masters Cup (to be renamed to the ATP World Tour Final) tournament moves to London in 2009, the live coverage situation for North American viewers will be more ideal. Surely, the ATP must have had this consideration in mind with this move. Some will say that my rant is irrelevant because you could watch this match on ATP Masters Series TV, a site that streams some ATP tennis matches live for a fee. To me, while with TV broadcasting of live sports being in its infancy, it cannot be considered a replacement for what we can get today; a high or even a standard definition television feed over 'regular' television broadcast mediums, whether it is cable or satellite. Going the pay-per-view route, whether it is through the Internet or television is another move that won't win over too many tennis fans. Broadcasting sporting events over the Internet is definitely in our future, but let's not forget about about what we are capable of doing with television today. That said, congratulations to Roger Federer, who defeated David Ferrer 6-2, 6-3, 6-2 to win the Tennis Masters Cup for the fourth time in five years. 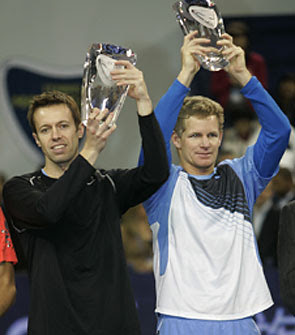 In addition, congratulations are also in order for Mark Knowles and Canadian Daniel Nestor, who won the doubles final over Simon Aspelin and Julian Knowle 6-2, 6-3 in what was the final match together for the winning team. 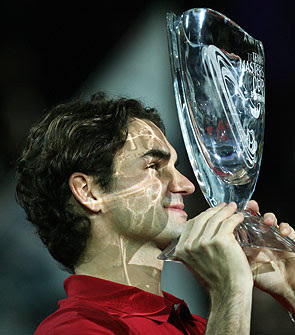 Hopefully, next year brings even better tennis and better television coverage for the ATP Tour. I am not usually one to write about concerts. I have been lucky to see many, with huge majority in near past being ones where I have been working, either through production work, or through ushering. I have always been a fan of Sting (Fields of Gold, Desert Rose and Fortress Around Your Heart are probably my favorite songs by him), and I knew prior to his solo career, that he was part of The Police along with Andy Summers and Stewart Copeland. 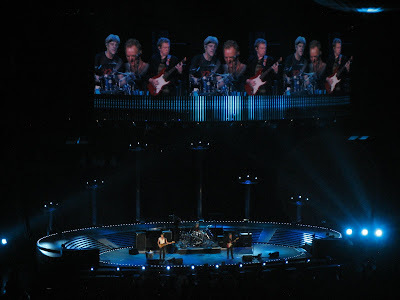 As everyone probably knows, The Police broke up in the mid-1980s, but reunited in early 2007 with the announcement that they are undertaking a world tour from the middle of that year on until mid-2008, in celebration of the 30th anniversary of their hit single "Roxanne" and also, to a lesser extent, that of their formation as a group. Originally, there were only going to be two shows in Toronto at the Air Canada Centre, which took place earlier in July of this year. Due to high demand, two additional shows were added, one last night, and one tonight, and as a result, I pounced on the opportunity to get these tickets. One night removed from the show, I am glad that I had a chance to see them live. While I did not know all the songs that were performed, all the songs that I did know (Message in a Bottle, Walking On The Moon, Don't Stand So Close To Me, Every Little Thing She Does Is Magic, Wrapped Around Your Finger (fav song of the night), De Do Do Do De Da Da Da, Invisible Sun, Walking In Your Footsteps, Roxanne, King Of Pain and Every Breath You Take) were done in a familiar, yet slightly updated manner. I really liked the songs where Copeland alternated between his primary drumkit and a secondary percussion kit of kettle drums, xylophones, chimes, suspended cymbals and some other 'stuff' (Wrapped Around Your Finger and King of Pain). See the below video clip (from an earlier concert) for an example of Copeland at work. The stage setup was pretty simple split oval design, ringed with lights. It was nothing fancy compared to other stages that I have seen; no doubt the band let their music be the highlight of the show, as it should be. The production of the concert was also pretty straight forward. Video screens above the stage showed close ups of the three performers most of the time, but there was some pretty interesting footage during some of the songs, particularly during Invisible Sun (the photo image montage of children dealing with war, conflict, natural disaster, abuse and displacement, see 'Invisible Sun - The Story behind the Pictures' for more details and the video) along with video footage of The Police in their younger days during their final song of the night. Tickets to the concert were not particularly cheap but for the experience of seeing The Police live, it was worth it. Part of the proceeds of the concert will be going to Wateraid, an international non-profit organisation dedicated to helping people escape the poverty and disease caused by living without safe water and sanitation. Of course, what concert could I go to without running into somebody I know. I ran into Raya, a fellow volunteer at Tennis Canada in the same Transportation Committee as me. It seems that a lot of volunteers in my committee saw one of these Police shows based on conversations I had over the summer. Lastly, thanks Liz, for coming to the concert with me, even though you were not feeling very well. Hope you had a great time, and hope that you get well soon! This past weekend, I helped out at the Tevlin Challenger Tennis Tournament, held at the Rexall Centre's Compass Centre of Excellence in Toronto. Prior to agreeing to helping out, I honestly did not know too much about this event. Now that I have had the opportunity to learn more about the tournament, here is my chance to share what I have learned about the tournament. The Tevlin Challenger is a women's tennis tournament that is sanctioned by the International Tennis Federation (ITF). It is classified as a $25,000 tournament, which means that the total prize money (purse) for the tournament is $25,000. It is a 32 player singles main draw tournament, a 32 player singles qualifying draw and a 16 team doubles main draw. Where does this tournament lie in the tennis hierarchy? The following chart shows the levels of tennis tournaments for women. At first glance, it would be easy to say that this event is quite a step down from the Rogers Cup, which is a Tier I (56 player main draw) event. I wouldn't dispute that at all. However, it was a real eye-opener to see many of these players competing with the hopes of acquiring ranking points to help them move up to the next level of the professional competitive ladder. With the lack of media coverage for these lower tier events, not many people see the plight of players at this level, working up the ranks, attempting to live out their dream of becoming an elite tennis player. There was a large mix of players at this event, from young juniors to more veteran players. Some of these players even played at the Rogers Cup earlier this year. While there were a lot of Canadians in the qualifying draw, I was especially surprised to see the number of players who came from overseas to play in this event (the entry list can be found here). One of the duties that I assisted with was driving the players to and from their hotel. This was quite the change from my duties at the Rogers Cup, where I would be co-ordinating various transportation related requests and managing volunteers who do the driving. It was also nice to not have to be in charge for once; just being able to help out was really refreshing. Because of this, I had the opportunity to talk to the players about their experiences. With the common bond of tennis aside, it was nice to see the human aspect of these players. Everybody had their own story to tell, whether it was a first or a repeat visit to Toronto, the joy of participating in tennis camps all around the world, life as professional player after completing college, travel adventures and/or nightmares or even talking about their home city/countries. Who knows what the future holds for these players. Maybe in two years, I hope to see some of these players again at the Rogers Cup. The Tevlin Challenger was founded by Tevlin family of Toronto as part of a generous $500,000 donation made to Tennis Canada's High Performance Development Strategy in 2005. Qualifying play started on Sunday and concluded on yesterday (Monday). Main draw play will begins on today (Tuesday, November 6) and concludes with the finals on Sunday, November 11. The event is open to the public, with no charge for admission or parking. If you are interested in tennis, you should really consider coming out to watch this event. Matches begin at 10:00 a.m. during the week, 11:00 a.m. on Saturday and the finals will be played at noon on Sunday. For more information about this event, see the Tennis Canada news article 'Tevlin Challenger to Begin Next Week'. If you are not in Toronto, take a look at the ITF website to see what tennis tournaments are being held (see the Mens Circuit, Womens Circuit, Juniors, etc). Perhaps there might be one of these tournaments happening in your area. Yesterday was Halloween. I actually had a couple of Raptors tickets for their season/home opener, but I wasn't really in the mood to go. Gave them up to a couple of friends of mine, and decided to stay at home. It's been a while since I've been at home during Halloween. I always remember Halloween as being one of my favorite holidays. Being at home, it was amazing to see the work that some people put into getting into the Halloween mood. I took a walk around the neighbourhood to see what people had done, and was amazed by the lengths that some families took into decorating their houses for the occasion. Unfortunately, I didn't have my camera, so I couldn't take any pictures. While my parents weren't the biggest fans of the candy distribution, I decided to give out candy to the kids once I got home. We didn't really have any candy at our house, but it was a good thing that Gary had a lot of junk food around, so I 'borrowed' some of that supply. While not too many kids came up to our house, those that did were probably happy with what they got. Later that night, Shima messaged me asking for help securing a highly sought after gift (hint, it is something I appeared in a newspaper for last December). Luck must have been upon us, because I found one for her pretty quickly. I don't think I've ever secured one of these items with about one hour's notice. The Raptors ended up winning their home opener against the 76ers by a score of 106-96. My friends enjoyed the game, I got to enjoy Halloween, and I was able to help a friend out. I think everyone won that night. Due to some issues that people had with the original release of the October 2007 Cumulative Update for Media Center for Windows Vista, Microsoft has re-released this update. You can download the latest update from Microsoft Downloads. Look for the v2 in the filename to confirm that you are downloading the re-release. For those that are experiencing issues after installing the initial release, you should download and install this update. It's a really busy weekend in Toronto. With so many events happening at the same time, I really wonder if there was any thought by all these event organizers to deal with conflicts between all these well publicized events. Then we have the 16th annual Canadian Breast Cancer Foundation CIBC Run for the Cure on Sunday morning. This event is part of a fund raising event held all across Canada that generates millions of dollars of donations to fund innovative and relevant breast cancer research, education, and awareness programs. If that wasn't enough, we also have the Scotiabank Toronto Waterfront Marathon. This marathon, which takes place entirely in the downtown area, is one of two Toronto marathons (the other being the Toronto Martahon) to act as a qualifying marathon for the Boston Marathon. All these events are large events in their own right. While some people might only have interest in one of these three events, I feel bad for those who would have been interested in doing more than one of these events. Either they would have had to make a choice to do only one of these events, or have a less optimal experience at two events, in order to get something out of them (i.e. perhaps do half of Nuit Blanche on Saturday night, and then be tired during their runs early Sunday morning). Perhaps I am over-estimating the number of people who might have been interested in doing more than one of these events. If so, I am complaining about nothing. But in case I do raise a valid point, I hope that next year, the organizers of these events plan it such that they don't fall within the same weekend. 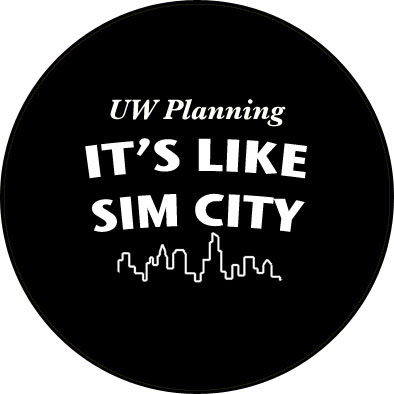 Everyone (the participants, the event, the causes and the host city) will win from this. The 2007 US Open came to an end yesterday night with an amazing men's singles final match won by Roger Federer. Want to buy US Open merchandise? Purchase them during a match, not in between matches, and certainly not in between day and night sessions, otherwise be prepared to wait. On that note, if a booth doesn't have what you want, walk around the grounds or even inside Ashe to see if what you want is available. But don't leave it until the end of the night session, at this point, even the vendors are ready to go home. Same goes for food. If you are hungry during the second night match, there might not be any food left, so plan accordingly. Got an American Express card? Take advantage of what they have to offer to their cardholders. They had free radios and portable TVs (loaners) available, as well as free souvenir pins for those who spent over $75 on the grounds using their AMEX credit cards. The $7 Unlimited 1 day MetroCard for New York City Transit is a great deal. Do your 'touristy' stuff during the day, and then use it to get to USTA Billie Jean King National Tennis Center all on one fare. If you don't mind splurging, the Long Island Railroad is another option for $8 (round-trip). Taxi? Costs much more (at least $30 from Manhattan)and takes just the same amount of time. Driving? Good luck finding cheap parking. If you are travelling in a group, make sure everyone has their ticket in their own possession. Don't hold someone else's ticket for them. If you were ever to get separated from your group without your ticket, trying to find one person amidst 23,000 or more people is not an easy thing to do. Hate the long line-ups at the East Plaza Gate (especially if you take the subway/train)? Take a walk down to the South Plaza Gate and you will find a significantly shorter line. While you are there, take a little detour and check out Unisphere and/or the rest of Flushing Meadows-Corona Park. We all remember Pong. Essentially you get an overhead view of the two 'players' with the ball and net across the middle. If you want to see real players from a similar view, go to the mid-level of Louis Armstrong Stadium, and then walk over to the bridge over the west side of the grandstand. You will get a near-overhead view of the action, one that is much closer than those shots from the Goodyear blimp that we are all fond of on television. Leave your backpack at home or at the hotel. You won't be able to get on the grounds with it. If you are bringing that much stuff to the grounds, chances are, you are bringing way too much. Carry your stuff in, and find a bag inside the grounds, as many sponsors have bags you can get for free while supplies last. If you must bring a bag, make sure it is no larger than 12″ X 12″ X 16″ (your bag will be subject to search, which involves another longer line-up). See the 'Security Information Page' at the US Open website for further information. My personal suggestion to avoid all this hassle is to wear pants/shorts with lots of pockets (i.e. cargo style) and if necessary, hand-carry a jacket. The US Open isn't the only game in town in this city that never sleeps. For example, we ran into Brazilian Day festivities on the Avenue of the Americas. Enjoy New York and all it has to offer, with friends, family or loved ones. Who knows, maybe you will be the next to write about your experiences online.